Epoxy-Coat® is a well-known brand that has been around for over 35 years. They have always been recognized for their commercial quality, single coat epoxy garage floor coatings. Admittedly, we had been putting off doing a review for a couple of reasons. However, due to recent changes in their lineup we found that it was time to re-evaluate Epoxy-Coat® and everything they now have to offer. Why did we put off a review? Simply put, it had to do with the fact that Epoxy-Coat® only offered one thing for many years — a highly successful 100% solids epoxy garage floor coating that they marketed as a durable one coat system. We believe that their strategy was to compete with the less expensive and inferior DIY epoxy paint kits that were, and still are, available in the market today. It’s a very large audience that supports these types of DIY products. Though their one coat kit is more expensive than these simple water-based DIY kits, the Epoxy-Coat® garage floor coating is up to 4 times thicker after curing, 4-5 times longer wearing, more resistant to stains, much more glossy and overall a far better value. The benefits of garage floor epoxy are many and the quality of the product makes a big difference. If you are not familiar with high solids epoxy, we suggest reading our article that explains the differences in epoxy, solids content, and the advantages of a 100% solids epoxy. The rub for us, however, was that for many years Epoxy-Coat® did not offer, nor did they recommend, the importance and benefits of using an epoxy primer with 100% solids epoxy. High solids epoxy can occasionally develop some application issues when applied directly to concrete without the use of an epoxy primer. This includes fisheyes, bubbles, and pinholes. It’s one of the reasons that they address these issues in their application instructions. Also, due to its viscous nature it does not penetrate concrete as well as coatings with a lower solids content. This can lead to possible delamination issues with concrete that is more dense (harder and less porous) and has not been prepped as well as it could have been. Though an epoxy primer is technically not a requirement, our position at All Garage Floors has always been that the application of a 100% solids epoxy should include the use of an epoxy primer coat first. In fact, it’s standard practice for garage floor coating contractors and professional installers. Many vendors who now sell 100% solids epoxy in kit form only offer it with an epoxy primer. You cannot opt out of using the primer in their kits. Additionally, for quite a few years Epoxy-Coat® offered a clear as a top coat option, but they didn’t really promote the advantages of it either. Again, we feel this was a marketing strategy at the time to compete against the cheaper DIY epoxy paint kits. None of this meant that their epoxy performed poorly without a clear coat or that people routinely suffered the maladies of applying a 100% solids epoxy to bare concrete. On the contrary, their epoxy is very good and the majority of people who used it during all those years left great reviews for the most part and highly recommended it. We also want to make clear (pardon the pun) that you do not have to use a clear top coat to realize all the advantages that their 100% solids epoxy offers. So long story short, we just didn’t agree with Epoxy-Coat’s® philosophy regarding epoxy primers and we weren’t fond of the fact that they did not tout the benefits of a clear top coat. Thus, they were not high on our radar in terms of doing a review, though we always stated that it was an excellent product when asked about it. Well the garage floor coating market has changed over the years and so has Epoxy-Coat®. Not only do they offer an epoxy primer as an option with their kits, they also have various kit options that include an epoxy clear coat (which they highly recommend). They also have an additional option of using a high performance polyurethane clear coat. Furthermore, they have a variety of other accessories and repair products that you can purchase in order to help accommodate most of your installation needs. In short, they have become a full service garage floor epoxy vendor that offers a variety of coating systems instead of just one. Now that we have we have provided a brief history of Epoxy-Coat’s® evolution, let’s discuss what their products are, how they perform, and what they can provide for you and your garage flooring needs. At Epoxy-Coat’s® core is their very popular commercial quality, 2-part 100% solids cycloaliphatic epoxy coating. It is available in 17 base colors plus clear. It may sound like a mouthful, but we will explain. Due to the many variables in computer monitor settings, the sample colors shown above may not be accurate and should only be used as a reference. 100% solids provides for a much thicker coating. It means that there are no carrier agents (water or solvents) to evaporate from the part-A epoxy resin and part-B hardener once the coating is mixed properly and applied. All floor coatings are applied at an approximate wet film thickness based on stated coverage rates. As an example, one of the popular water-based DIY epoxy kits with 50% solids by volume will provide an approximate wet film thickness of 5 mils based on the coverage rate. Once cured, it will have an approximate dry film thickness of 2.5 mils. This is because as the epoxy cures, the water evaporates and the coating thickness shrinks. The average wet film thickness of Epoxy-Coat® is 9.7 mils when following their recommend coverage rates. Because there are no carrier agents in the epoxy to evaporate, the coating will not shrink and the dry film thickness will remain at 9.7 mils. Additionally, because there is nothing to evaporate, the coating has no VOC’s and it does not produce a strong smell. This is ideal for applications within the home such as a basement. It also means that it can be used in states with strict regulations for VOC content. This thicker coating provides for much longer wear and durability, better stain and chemical resistance, as well as high resistance to hot tire pickup and road salts. Moreover, because the coating does not shrink while curing, it will self-level and hide spider cracks and other small irregularities in the surface of the concrete. As many have unfortunately found, lower solids epoxy will expose these irregularities as it shrinks while curing. Epoxy-Coat® also promotes their epoxy as being cycloaliphatic. This is achieved through special curing agents that are used in the part-B hardener. Cycloaliphatic epoxies can be more chemical resistant, have improved moisture tolerance during application, have a greater resistance to water spotting, and increased outdoor weatherablity. 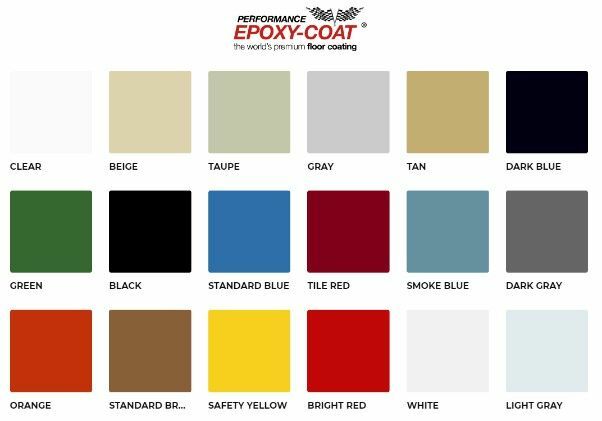 As we stated earlier, Epoxy-Coat® now offers an epoxy primer option that you can select with the purchase of most of their kits. If the option is not available in kit form, you can always add it to your cart separately. Most epoxy primers are either clear or offered in different color tints. Colored primers are ideal when using a light colored base coat as they can prevent color bleed through in light colored epoxy due to darker concrete. Epoxy-Coat’s® primer is actually dark in color. We discovered this when we made a few phone calls asking questions in order to evaluate their customer help line. The primer consists of a collection of remaining product from large batch runs that is leftover and cannot fill a standard packaging container. As a result, the epoxy is dark in color from all the different color batches that are combined. It is then thinned to make it less viscous. Lab testing has shown increased penetration into concrete substrates (This is good!). So don’t panic if you open up a primer kit to find it dark in color. In fact, dark primer is actually preferred when applying metallic epoxy. What Epoxy-Coat® does is create a number of garage floor coating kits that you can build around their 100% solids epoxy. Most all kits include decorative color flakes, aluminum oxide non-skid additive, and a phosphoric acid clean and prep solution to etch the concrete. Additional options that you can choose for most kits are application tools, epoxy primer, polyurethane clear coat, spiked shoes, and a U.V. additive. 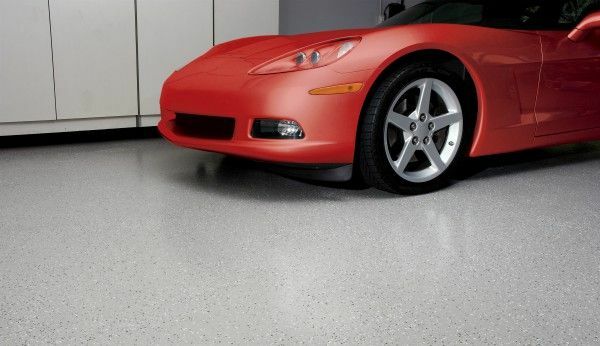 We listed their primary garage floor coating kits below. Standard Kit. This is their customary 9.7 mils single coat garage floor epoxy kit that they are famously known for. The kit includes your color choice of epoxy and enough color flakes for a light density application. This kit is a good value for those on a limited budget that want a good quality coating for the least amount of money. Premium Kit. This is a two coat epoxy kit that includes your base color coat, enough color flakes for a medium density application, and a clear epoxy coat to lock in the color chips. This kit provides for a total coating thickness of 19.7 mils. Rejection Kit. This is the same as the premium kit, but instead includes enough color flakes to apply to full rejection. This means that the color flake combination that you choose will dictate how the floor looks. Total thickness is 40 mils. Interestingly enough, they do not include epoxy primer as an option, though you can still add it to your cart via the Shop > Products menu drop down. We believe their reasoning for not offering it as an option in the kit is that you wouldn’t have to worry about cosmetic issues in the color coat due to it being completely covered by color flakes. Super Rejection Kit. This is the same as the Rejection Kit, but it also includes their high performance polyurethane clear coat to apply over the epoxy clear. This provides the best abrasion and chemical protection. Metallic Kit. This kit consists of the 100% solids epoxy, metallic tint and the epoxy primer. 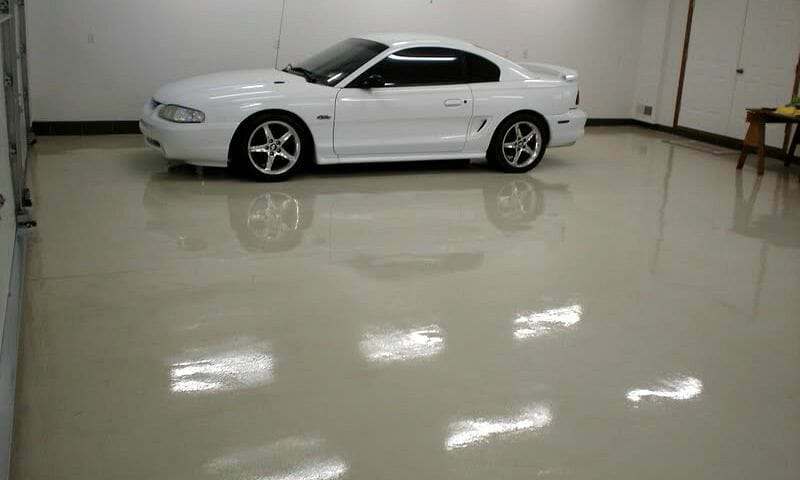 We highly recommend the optional polyurethane clear coat for a metallic epoxy garage floor coating. In addition, Epoxy-Coat® has touch up kits available for purchase for their colored and clear epoxy. This is a great option to have available as many large vendors do not offer such kits for possible repairs later down the road. They also have available a concrete patch kit which can be used for crack repairs, filling divots, pitting, spalling, and filling joints. Our experience has shown that the application tools most garage floor coating vendors supply rarely is enough to get the job done and Epoxy-Coat® is no different. It’s a good start, but you need more. Our suggestion is too purchase additional supplies online or from your local home improvement center. This would include high quality lint free rollers, latex gloves, a cheap tarp to do your mixing and assemble product, and etc. If you do this and plan out all your steps in advance it will always lead to better results and an experience that is not hectic. Planning ahead this way allows for you to ask questions before you begin and not be in the undesirable position of having a question right in the middle of your project. Purchasing Epoxy-Coat® products is actually quite easy. They have a full service website with all their product kits, options, and accessories available. Shipping for most garage floor kits is free. However, the Rejection Kits require a freight quote due to the additional weight of all the color flakes that are required. Orders over 250lbs require a freight quote as well since it is shipped on a pallet. You can email or give them a call if you have any questions. We did this a number of times to evaluate their customer service. We found their service representatives friendly and knowledgeable whenever we contacted them. We can’t emphasize enough how important good customer service is when working with concrete coatings. Epoxy-Coat® even has an installation division if you do not want to apply their product on your own. You can contact them for more information and pricing for that service. Can we recommend Epoxy-Coat®? Yes we can. We already knew they had good epoxy and readily admit that we like the changes they have implemented in the last years. It’s a great improvement to an already proven product. Why the changes? Our guess is that it most likely has to do with the fact that the current DIY garage floor coating market has grown tremendously in popularity and consumers are becoming more educated with the process. We feel that as good as their 100% solids one coat epoxy kit is, it had left them in a type of “no man’s land” so to speak. Educated consumers who didn’t want the limited performance of the cheap DIY epoxy paint kits began exploring options for multi-coat epoxy systems. Fortunately, Epoxy-Coat® recognized the changes going on in the market and they adapted by providing more options. They truly are a full service floor coating vendor that offers high quality product and multiple garage floor coating systems at a good price point. What is the process used to repair garage floor surface imperfections before applying the final coat? Road salt has eroded the smooth concrete surface. Hello Mike. It requires cleaning the surface well and removing any loose debris. You then trowel into those areas a polymer-modified repair cement or epoxy repair slurry. We have an article on the process here. Such repairs do require that you grind the area flush with the existing concrete in order to provide mechanical bite for the epoxy and to ensure an even transition so that the repair does not telegraph through the coating.